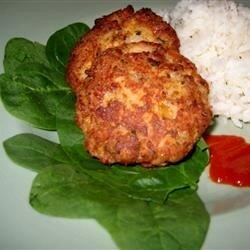 "These salmon patties are delicious for lunch or dinner." Try this quick and simple salmon patty recipe, perfect for dinner tonight! so simple yet so good!!! a great basic recipe...i added 1 tbs lemon juice, a sprinkling of pepper, prarika and served it with thai sweet chilli sauce and wasabi mayonaise!! Yum! !